1. 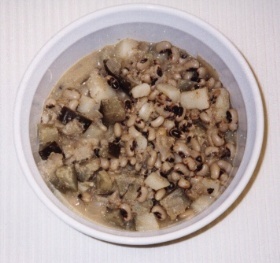 Soak the black-eyed peas in water for 1 hour. Drain. In a 3-quart saucepan, simmer the peas in 5 cups of fresh water to cover. After 25 minutes, add the onions and potatoes. Add the eggplant 5 minutes later. Continue to simmer for 5 minutes, or until all the vegetables are tender. 2. Add the curry powder, cayenne pepper, cumin, coriander, cocunut milk, and salt. Simmer for 10 minutes until the flavors are blended. 3. Serve hot with rice, chapatis, or toast. You may substitute aduki beans for black-eyed peas in this dish, and any vegetable goes well, too.